Crossing roads: West 15th Street and Lonsdale Avenue. 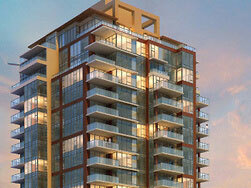 A sanctuary of natural indulgence, 15 West is the epitome of an oasis surrounded by a world of urban conveniences. 15 West is a grand 18-storey steel and glass tower with a podium of two floors in the heart of North Vancouver’s vibrant Central Lonsdale. 15 West is developed, designed and marketed by an experienced team at Grosvenor, Citimark Developers, IBI/HB Architects, Trepp Design Inc and MAC Marketing.